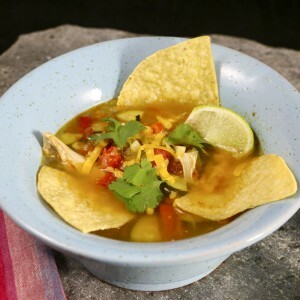 Chicken tortilla soup is a family favorite. I make a huge batch in a 4-gallon pot. If I am not serving a crowd I freeze the leftovers in individual and family-sized servings in ziplock bags. The soup freezes very well and there is nothing like coming home after a busy day and being able to pull a home-cooked, healthy meal out of the freezer. If you only have a 2 gallon pot cut the recipe in half. Use your food processor to do the chopping and you will greatly cut down on the prep time. The ingredient quantities are flexible and do not need to be exact. Toasting and hand-grinding the cumin and coriander seed really brings out their flavor. 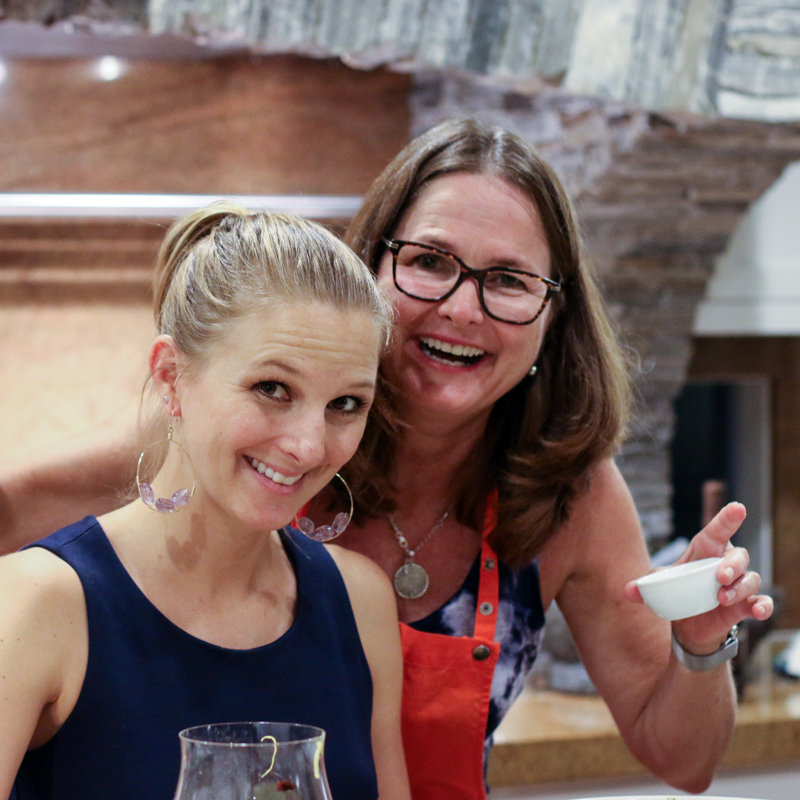 I use a traditional molcajete to grind my spices, but a mortar and pestle or electric spice grinder will also work. Serve with a LOT of fresh lime wedges to squeeze into the soup. Offer a variety of garnishes so everyone can put their own creative touch on their meal. I offer bowls of diced avocado, chopped cilantro, lots of lime wedges, tortilla chips and shredded cheese. For a heartier soup, ladle soup into serving bowls and add a scoop of rice to each bowl before you garnish. I grew up in Honolulu and we added rice to everything. Most local families have a rice cooker going all the time. I always added rice to my family's soup when my kids were younger. Now that I am an empty-nester and fighting an expanding waistline I forgo the rice. A family favorite, this chicken tortilla soup gets extra flavor from toasting and hand-grinding the spices. An array of garnishes make it fun to eat. If you don't eat the whole pot it freezes perfectly. Toast your cumin and coriander seeds in your soup pot for a few minutes, stirring frequently and taking care not to burn. Remove the seeds and grind in a molcajete, mortar or electric spice grinder. Pulse garlic and jalapeño in food processor, using the basic chopping blade until finely chopped. Add onions and continue pulsing until coarsely chopped. Do not over-pulse or you will get onion juice. Heat your soup pot, add a generous pour of olive oil to the bottom of the pan, heat and add garlic/jalapeño/onion mixture. Cook about 7 minutes on medium-high, stirring and taking care not to burn. Add crushed coriander and cumin seeds. Stir and cook another 3 minutes. Put tomato halves in food processor and pulse briefly using the chopping blade. Add tomatoes and sea salt to onion mixture. Reduce heat to medium, cover and cook 10-15 minutes, stirring occasionally. Add chicken stock and bring to a boil. Add whole chicken thighs and turn down heat to medium-low. Cook about 15 minutes until chicken is cooked and tender. Do not overcook or chicken will be tough. Scoop chicken from pot and let cool in a bowl while you continue adding ingredients to the soup. Once cool, shred chicken into bite-sized pieces. Add zucchini and chopped roast peppers, simmer about 15 minutes, until the zucchini becomes tender. It will change from opaque to a little translucent. Add shredded chicken, corn kernels and oregano and cook another 5 minutes. Ladle up soup and offer bowls of garnish -- diced avocado, cilantro, cheese, tortilla chips and lime wedges. Optional: add a scoop of rice to each blow before garnishing. HI Joyce — Just realized I had not given you measurement. My 1/3 bottle translates to a very full 1/3 cup. I love that you are buying spices at an Indian market. Sounds like a fun excursion to me! Can you omit the chicken and use a vegetarian both for this recipe and get a good result? Hi Bonnie, definitely you can. I would just add more veggies to the soup. You could add potatoes or carrots. Please let us know how it turns out!